Is there anything better than a frozen, refreshing popsicle on a hot day. These popsicles are all natural, sugar-free and low-carb – made with lemons, strawberries and blueberries. Heat strawberries, blueberries, lemons, Sukrin:1 and 1 cup water in a small saucepan. Boil softly until the blueberries pop and the strawberries are very soft. Strain the mixture into a bowl. Make sure to leave the pulp in the strainer and get all the liquid into the bowl. A metal strainer is best, using a spoon to stir and pat down. We used the pulp as a sugar-free jam – it was delicious! 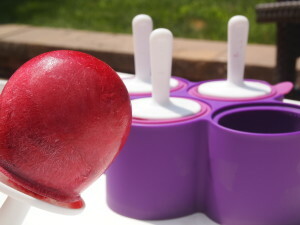 Stir the remaining 3 cups of water into the mixture and pour into popsicle molds or bags. We used a mold from Zoku. Freeze until solid and enjoy this delicious sugar-free healthy treat!